Serveria Review 2019: Is Serveria a Good Hosting? Serveria offers competitive prices and covers the needs of all kinds of website owners, from the casual bloggers to those with multiple websites or online shops. Serveria is based in Latvia and offers affordable packages with custom server configuration. It is in business since 2009. If privacy and confidentiality are important to you, Serveria is the right host to consider because they take customer confidentiality very seriously. There are two different types of control panels offered by Serveria: the cPanel, and the Virtualmin control panel. 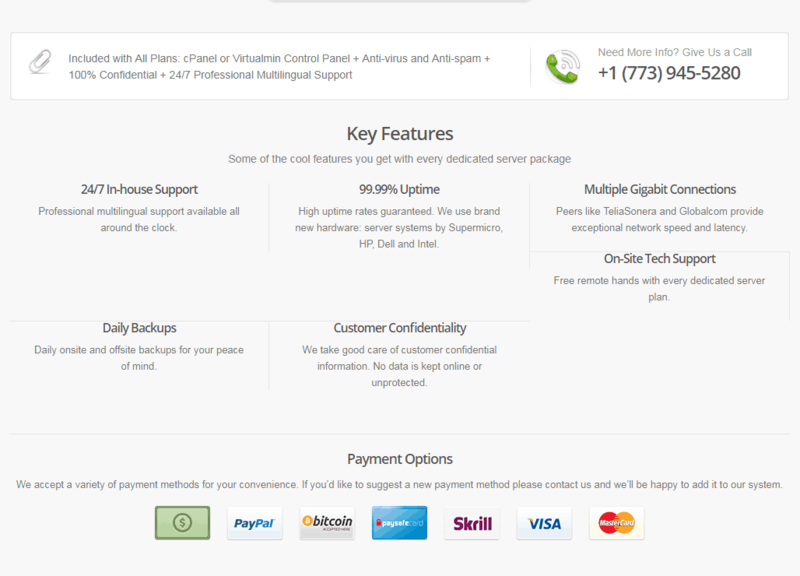 The cPanel control panel includes the Softaculous Auto-installer. Softaculous ensures that even those with little technical knowledge can make use of blogging or e-commerce software like WordPress, Joomla, and others. All you have to do is follow the instructions and let the auto-installer install the applications or scripts for you. Thanks to the multi-gigabit connections offered by them, you are guaranteed exceptional network speed as well as latency. The hardware used for the servers comes from high-quality and well-known names like Dell, Intel, HP, and Supermicro. This is what helps them achieve a 99.99% uptime. As for security, you can utilize daily backups so that you always have the latest version of your website available in case things go wrong. None of your data is kept online giving you more security and confidentiality. The protection against virus and spam further ensures that the online experience is safe for you and your website’s visitors. Serveria offers website hosting solutions in three different packages named Start, Business, and VIP. The Start package offers 1GB storage space, the Business package 5GB and the VIP package 20GB. You can have unlimited traffic to your website in all the packages. You only get unlimited domains and email accounts in the VIP package while the other two packages only offer these in a very limited quantity. Some common features of all the packages include access to an easy to use Control Panel, FTP account and support for PHP5, PHP7, Perl, CGI, and Ioncube among others. For casual bloggers and website owners, the first two packages are both affordable and sufficient. However, as soon as your web requirements increase, the VIP package, costing only three times as much as the Start package but offering unlimited features, is worth its cost. As for their customer support, they offer multi-lingual and 24/7 In-house support for their customers. This includes live chat through Facebook and WhatsApp messengers. Alternatively, you can call them or reach them by telephone. They look like a support team that is social media friendly and while this is a great advantage for many, it can be very irritating who don’t use these platforms too often. They even offer support through Skype. At first sight, Serveria doesn’t look like a special host as they provide all the regular services that every hosting services provider provides. The 14-day money back guarantee is a great way to check out their features for yourself. Wondering how Serveria stacks up against other Web Hosting companies? Enter any other Web Hosting company and we will give you a side-by-side comparison.